Whenever I travel, I love to look at the graffiti of a place-it says a lot about where the culture is as a whole. Some places have elevated graffiti to an art form-it’s colorful, a feast for the eyes trying to unlock its pieces. Others are like this-written on a wall with marker and getting straight to the point. It’s written on the wall of the entryway of one of the old palaces of Mendoza, where General San Martin is reputed to have stayed. (San Martin is considered the liberator of Argentina from Spanish rule.) It’s now the Museo General San Martin, a museum that chronicles his life. It’s a bit dilapidated and in need of some care-which is what I think the graffiti refers to. 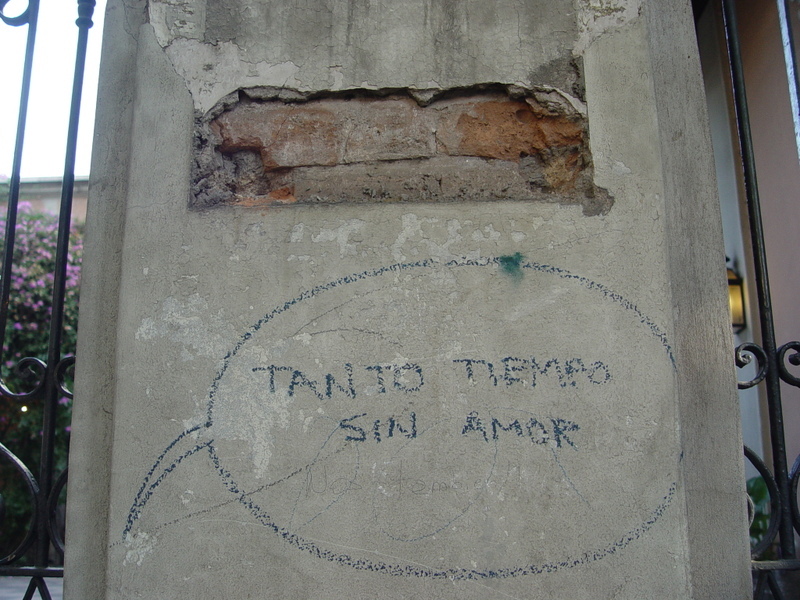 But the majority of graffiti in Argentina is what I would call ‘street poetry’-people have written sayings-funny, witty, humble-every-man’s philosophy. (Rather than the ‘tags’ we get here, themselves with a different merit) I know there have been books published about this type of graffiti-the thoughts of a community, cleverly and quickly scribbled across a wall using chalk, pen, or marker. Most of them are funny real-life proverbs, they make the reader laugh or stop and think. In contrast, I have been getting lots of love in the blogosphere lately! First, I’ve gotten my first-ever blog award-an award for Blogging with a Purpose, given to me by Gretchen Noelle of Canela y Comino. Thanks, Gretchen! I feel so honored-it’s wonderful to be acknowledged! She awarded it to me for sharing the cuisine of Argentina on my blog-I’m so glad my blog is doing what I set out to do-to share a culture I love so much with others, so that they can enjoy it, too! Also, with the start of the Empanada of the Month event Thursday, I have had so many replies and people who will be joining the empanada-making fun! That’s just been the best part of this blog-it’s been such a pleasure getting to know everyone and their blogs-it’s opened my world. Thanks to all of you joining me in the Empanada of the Month event (you won’t be sorry-they are tasty!) and thanks to all my readers, new and returning! It is so true, graffiti can say a lot. And some of what I see here is truly art! You certainly deserve the award, you are doing a fabulous job!! I always look at and photograph the graffiti too. It does say so much about the place.